Zidane who is the former French footballer but his current identity he is the coach of Spanish top flight Real Madrid. Under his charge, Real won last La Liga and Champions League but the ongoing season of La Liga seems too hard on Real. They just could not show their best form. They tested coupe of lose in La Liga already and so, considering the point table, they are behind than their rival club Barcelona. But the coach Zidane is not worry about the tough start of Real. Though, the starting of the season was not as expected. Due to the reason from outside of the club many still worries but Real coach still believes that his apprentices will finish the season very good. Besides, in current season of Champions League, they are placed in group H and from the last two matches, they have achieved just 1 points though they are the back to back UCL champion. In the meantime, in the first leg at the home ground, Real Madrid made a draw with Tottenham Hotspur by 1 – 1. In return in the 2nd leg at the ground of Spurs, the top successful Spanish club Real faced a defeat by 3 – 1 against Tottenham. In next tuesday night, they have a UCL match against Apoel Nicosia at the away ground. This is the club from Cyprus and to get qualify for the knockout stage, Real must win the match. Because they have already lost some points so far. In La Liga, the condition of Real is not good at all. 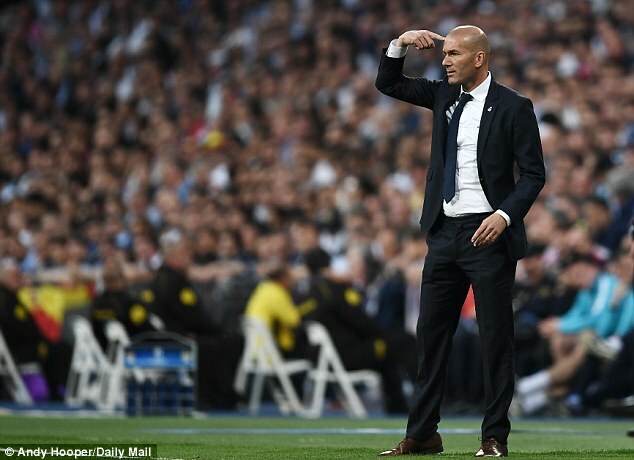 In last saturday at first Madrid Derby in the season, at the home venue of Atletico, Real left the ground by achieved a draw by scoring none and so, with their top rival Barcelona, the team of Zidane are still 10 points behind. Considering the history of Spanish top flight, no team can fill the huge point differences and manage the title yet. In all competition, Real won just once in last four matches where they lost twice and made a draw once. But the confidence of Zidane is still very strong. Nothing can change his confidence on his apprentices he stated earlier. He still remembered success after passing worst time. In last Monday this French coach made a press conferences where he stated that he is enjoying his work and be positive all the times. he believes that all things are not easy in life. Whatever happens, he has still confidence. Like last season, it is the tough time now. Someone can worry but he is not worry at all.